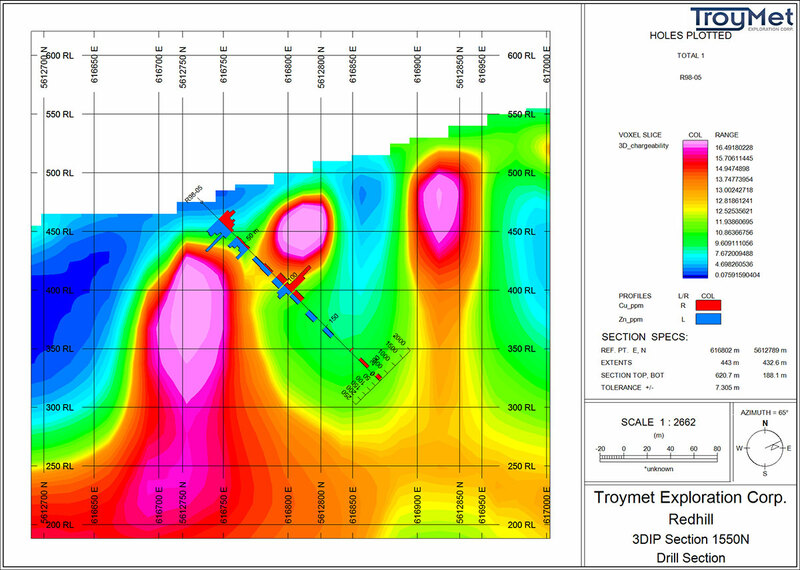 Troymet Starts Redhill Drill Progra… | Troymet Exploration Corp.
September 19, 2016 - Troymet Exploration Corp. (TSXV: TYE) (“Troymet” or the Company”) is pleased to announce that crews are mobilizing to its Redhill project to start the 1,000 metre diamond drilling program. Drill targets include both volcanogenic massive sulphides and gold mineralization. 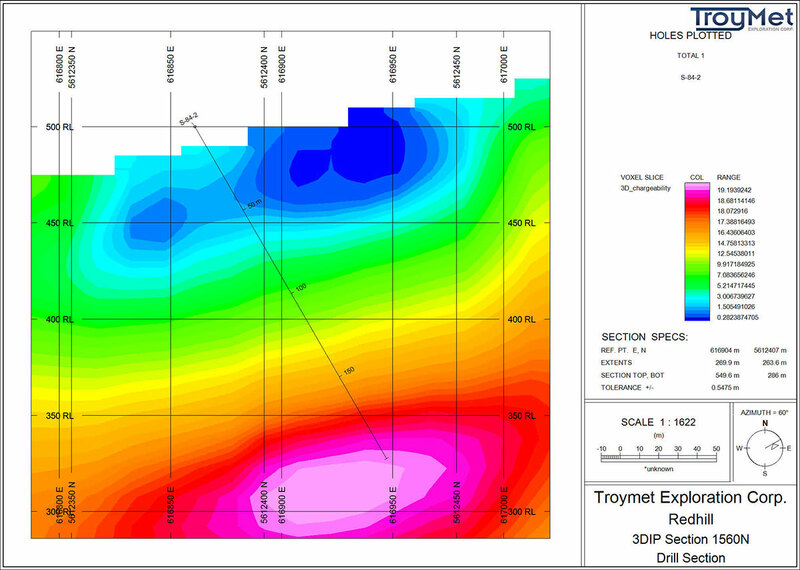 Troymet has completed an extensive 3DIP survey, detailed prospecting, and a large, two-phase soil sampling program on the Alpha zone, as well as compiling all of the historical exploration data. 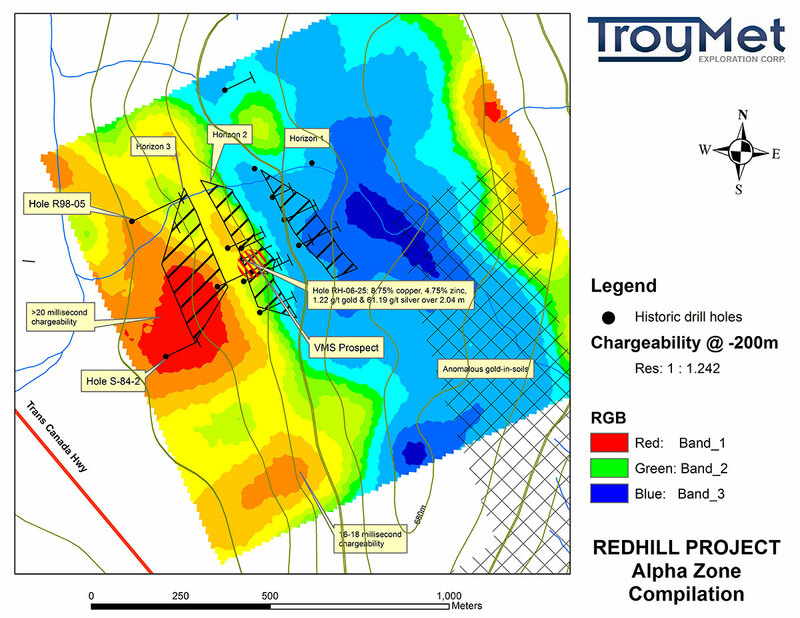 This work has identified a number of significant and untested drill targets as well as potential, untested extensions to the VMS prospect. This news release contains certain forward-looking information.All statements included herein, other than statements of historical fact, are forward-looking information and such information involves various risks and uncertainties.In particular, this news release contains forward-looking information in respect of: the Redhill Project, including the exploration and drilling to be conducted on the Redhill Project; potential drill targets and the potential results of the drilling and extensions to the project which may result from such exploration and drilling; and the potential timing for exploration and drilling on the Redhill Project.There can be no assurance that such information will prove to be accurate, and actual results and future events could differ materially from those anticipated in such information.This forward-looking information reflects Troymet’s current beliefs and is based on information currently available to Troymet and on assumptions Troymet believes are reasonable.These assumptions include, but are not limited to: the current share price of Troymet’s common shares and the ability to raise future equity financing, if needed, at prices acceptable to Troymet; Troymet’s current and initial understanding and analysis of the Redhill Project; the ability of Troymet to discover viable exploration targets and the results of exploration on the Redhill Project; the cost of exploration, including sampling and drilling, on the Redhill Project; Troymet’s general and administrative costs remaining constant; and the market acceptance of Troymet’s business strategy.Forward-looking information is subject to known and unknown risks, uncertainties and other factors which may cause the actual results, level of activity, performance or achievements of Troymet to be materially different from those expressed or implied by such forward-looking information.Such risks and other factors may include, but are not limited to: the early stage development of Troymet and its projects, and in particular, the Redhill Project; general business, economic, competitive, political and social uncertainties; capital market conditions and market prices for securities, junior market securities and mining exploration company securities; commodity prices; the actual results of current exploration and development or operational activities; competition; changes in project parameters as plans continue to be refined; accidents and other risks inherent in the mining industry; lack of insurance; delay or failure to receive board or regulatory approvals; changes in legislation, including environmental legislation, affecting Troymet; timing and availability of external financing on acceptable terms; conclusions of economic evaluations; and lack of qualified, skilled labour or loss of key individuals.A description of other assumptions used to develop such forward-looking information and a description of other risk factors that may cause actual results to differ materially from forward-looking information can be found in Troymet’s disclosure documents on the SEDAR website at www.sedar.com.Troymet does not undertake to update any forward-looking information except in accordance with applicable securities laws.